Los Angeles Mayor Eric Garcetti does not believe his city’s homeless crisis will derail a potential candidacy for president. "I'm the first to admit what we have to do, but whether it is the Olympics, whether it is infrastructure and passing the biggest jobs package in our history, the free community college, the raising of the minimum wage, we have a good story to tell. But we are honest about the challenges that we have whether it is homelessness or traffic, and the steady work we are doing with no help from Washington." Many political consultants believe the sidewalks lined with homeless tents, particularly the concentration in downtown Los Angeles, would be a devastating backdrop to any campaign for national office. But Garcetti says he would welcome the national press to downtown's Skid Row, which the Los Angeles Times recently proclaimed "a national disgrace." The conversation continues with Los Angeles Mayor Eric Garcetti. Will permanent housing for the homeless be built in your neighborhood? "I hope they come to skid row because federal cuts by this administration and in previous years are part of the problem. People ignoring a mental health crisis, people saying that housing isn't our responsibility anymore as it was in the ‘60s and ‘70s have only compounded this." 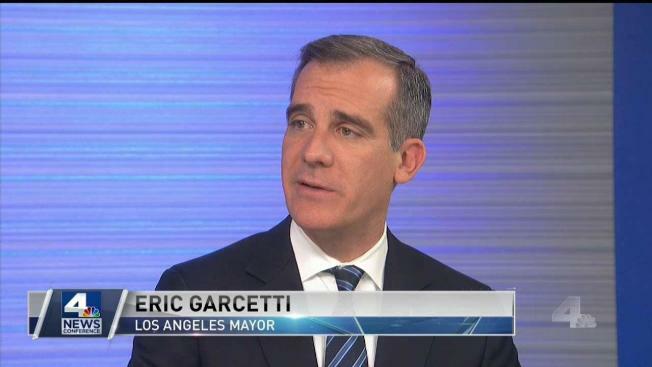 Garcetti made the comments on NBC4 LA's "News Conference" program Sunday morning. He said he will decide next year on whether to run for president. The Mayor argued that a record allocation of $420 million in his proposed budget will help cut homelessness in the city. His goal is to reduce the number of encampments by 50 percent within the next five years. But the Mayor acknowledged that if something isn't done on the state level that more homeless will continue to arrive, particularly out of California's prison system. There are estimates that a quarter to a third of those released end up on the street. He and nearly a dozen other mayors around the state recently lobbied for a bill that would allocate $1.5 billion to help stem the tide of homelessness that he believes has resulted from prison reform. “The savings of not putting them in jail, of releasing them should be put into anti-addiction programs, should be in job training programs ... I think the state owes us a big check," he said. In his budget, LA Mayor Eric Garcetti has earmarked a historic amount of money for street repairs. He explains the plan and talks about his rumored presidential run.